Now that is a Pie! As I mentioned in an earlier post, Zack turned 30 last weekend and he is not a cake person. Easy enough for me, I made pie. Believe it or not I have not made too many pies in my life. Prior to the three I made for Zack's birthday I had only made three, Frozen Lemonade Pie, Frozen Coconut Pie, and a Pecan Pie. Based on my limited experience with pie, I think they are quite a bit easier than cakes. 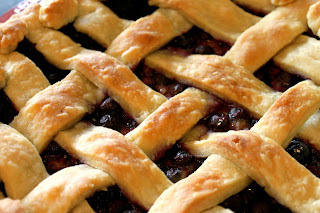 This was my first pie with a double crust; I thought it would be pretty to make the lattice on top and it was surprisingly easy. I am not very skilled at making pretty edges, so I used some of the extra dough and a small cookie cutter to cut out shapes for the edges. I was really pleased with the taste and the look of this pie. Just add a scoop of vanilla ice cream and you are set! Mix sugar, cornstarch, salt, and cinnamon, and sprinkle over blueberries. 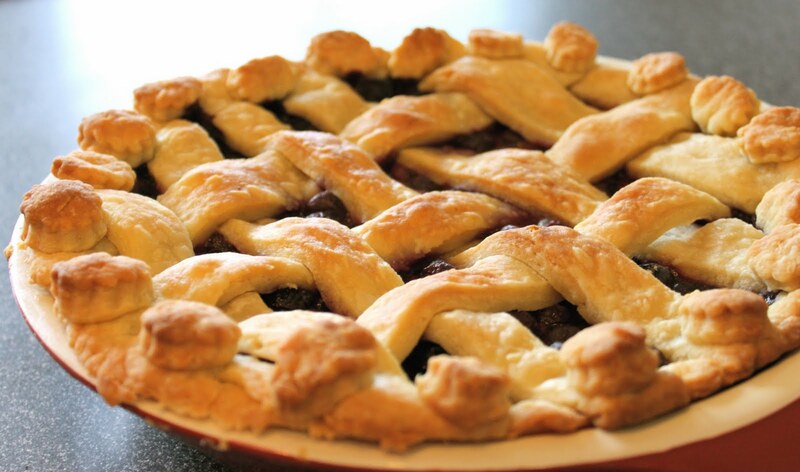 Line pie dish with one pie crust. Pour berry mixture into the crust, and dot with butter. Cut remaining pastry into 1/2 - 3/4 inch wide strips, and make lattice top. Crimp and flute edges. Bake pie on lower shelf of oven for about 50 minutes, or until crust is golden brown. Bakers note: I covered the edges of the pie for the first forty minutes w/ foil so it would not get too dark and removed it for the last 10 minutes.